A new addition to our collection of Executive Homes! This gorgeous 4034 sq. ft., 8 Bedrooms, 6 Baths, large Pool/Spa Luxury home is located at Windsor at Westside Resort close to Disney with spectacular community facilities that boast year-round family fun for a vacation of a lifetime! The modern open plan fully furnished home has been designed with each room uniquely decorated in Italian style. Great emphasis is placed on family and friends entertainment, a game room, flat screen TVs in every room, this home caters to all and not excluding the little ones. Comfort is key!! With an open layout in the Living Room, Dining Area and Kitchen, the family can enjoy quality time together with ample seating surrounding the large Plasma TV. The fully equipped large open kitchen has all stainless steel appliances and granite counter-tops. Also on the same floor is the Laundry Room for easy access to everyone. The luxury home starts with a King Master Suite on the first floor complete with king size bed and a large LED TV with a private bathroom leading to the lanai. Also on the first floor, is a Queen bedroom with LCD TV and adjoining private bathroom with a walk-in shower. The second floor has another Master Suite with King size bed and additional five bedrooms, all fitted with LCD TVs. This home has a large 26 x 12 ft pool plus a spill-over heated Spa, a large screen covered lanai complete with sun loungers deck chairs and ample dining for 16. A large BBQ grill/outdoor kitchen, outdoor sofas provide the perfect eating and relaxing area for the entire family. 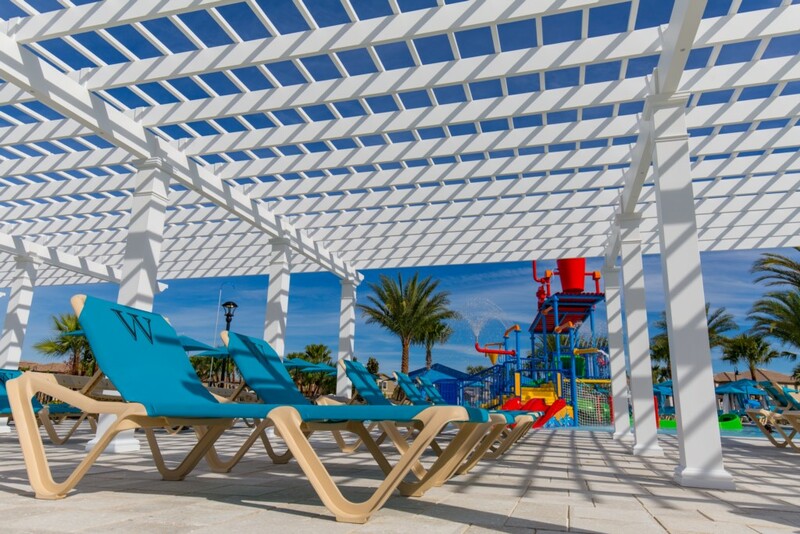 With safety in mind, the Pool Area access has a child security sensor and/or Child Safety Fence. The Den/Game Room upstairs is fitted with a large LED Smart TV, Air Hockey, Fooseball and X-Box with loaded games. This gorgeous home is walking distance to the Clubhouse! Complimentary Cable TV, High-Speed WIFI and free calls to Canada and U.S.
My family and I (8 adults, 8 kids) stayed the week of June 16-23 and we couldn't have asked for a better vacation getaway. This house had everything we needed and much more. The entire layout is very spacious and plenty of room for the little ones (or adults too) to get their quiet time and rest when needed. The outdoor patio was spectacular! Enough seating around two large tables for the entire family to gather around. Along with the pool, sofa/lounge, and outdoor grill, we loved every bit of it. Also located a few steps across the street from the community pool where we spent a lot of time as well. It was hassle free gathering our things and going across the street because of the close proximity. Located close enough to Disney and yet far enough away to get out of that environment as well. My family and I would highly recommend staying in this house. The owner and staff were great and very accommodating. We will definitely be back! Thanks for your lovely review, Mike. I'm delighted you all had a great time and look forward to welcoming you back! Best regards, Paul, Signature Florida Homes. This home is absolutely fantastic! Our party had 7 adults and 8 children. There was ample space for everyone in this 8 bedroom/6 bathroom house. There needs to be a few larger frying pans but other than that the kitchen is well stocked with dishes, silverware and glassware. Plenty of towels for the pool and an over sized washer and dryer for taking care of wet towels after an evening in the pool. Wish the pool and spa had been warmer, especially the spa. We will definitely book this home again!!! Hi Noli, Many thanks your lovely review. I'd delighted everyone has a great time and we hope to see you again in the future. Best regards, Paul. Signature Florida Homes. We had 12 family menmbers and there was plenty of room for everyone thanks to the upstairs section of the house. I would book again. Windsor at Westside is located off US 192 in the heart of Orlando's tourist district, just 30 minutes from Orlando International Airport and 8 miles to Walt Disney World theme parks. The resort is just a few minutes drive from shops, supermarkets and dozens of restaurants. This is an upscale house and was very neat and clean and has everything you can possibly need for a great vacation. Our only regret in renting this home was not staying longer! The house was immaculate and the décor was so fun. The owners were super responsive with any questions we had leading up to and during the trip. After lounging in the home's private pool we headed right across the street to get a frozen drink and float around the lazy river at the clubhouse. It was great to have access to a fitness center with full equipment while on vacation. We are already planning our next trip back! This beautiful Florida home was everything we had hoped for and more! With a large group everyone had more than enough space to feel comfortable and relaxed. The kids loved how each room was themed differently (especially the Star Wars room!!) The spacious open plan first floor allowed for our family to enjoy game nights and good old fashioned quality time together. Just a short drive from the parks this home is the ideal location and allows you to be part of the action while getting away from it all. 15/10 would book again!! This property is amazing, the decor is beautiful all rooms are a good size and very comfortable, the games & tv area upstairs with a mini kitchen is a fantastic touch, the pool area is great and what makes it even better is the size of the seating area being able to have our whole party (13) comfortably sit around the outdoor table was great most other villas only have a small table so this was defiantly a bonus, any queries we had were answered the same day which is fab as some companies can take days to reply. The resort this property is on was great with a pool, lazy river, bar, snack food and small shop most other resort don't have these amenities, my family are hoping to return in 2020 and I will definitely look to book this property again. I just got back from my third stay at this house and I will never stay anywhere else when I visit Florida. This is one of the only places I have ever stayed where the pictures and descriptions on the website actually match the house itself. Very spacious, very clean, very organized, very well decorated, and tons to do. From Xbox, Foosball, and air hockey in the loft to a quiet relaxing patio and private screened in pool. . . that's right, screened in, no bug spray needed. And when you get tired from all of that Florida heat, the AC inside is stellar. If all of this wasn't enough, the house has a prime location directly across the street from the club house which has even more. Bigger pool, lazy river, volleyball, and Tiki bar to tie one on. My expectations have been officially exceeded. Our vacation at this house was just perfect! The kitchen was well equipped with everything we needed to cook for our large family. The bedrooms were decorated beautifully and the beds and linens were high quality. We really loved the lanai. After a long day at the park, the kids were happy to spend the evening in the pool/hot tub-the water was crystal clear. We loved staying at this house and everyone is looking forward to our next visit! This house was PERFECT! We have a big family and were concerned about finding a nice place to stay for over a week. Everyone had a place to sleep comfortably and plenty of peivacy if needed. The open floor plan accomidated our large family, so that we could cook, swim, and hang out with each other all at the same time. The gated community plus the accommodations were amazing. We used the pool and arcade several times. We also liked the house's proximity to Universal, Disney, the outlets, and much more. We were never bored or uncomfortable. We liked staying here so much, I have already rented it again for next March!!! The house is absolutely amazing; We had a family reunion last month and it accommodated 10+ people without any issue. It is incredibly spacious on both floors, with an awesome pool in the yard. I would highly recommend the house if you're looking for a place for an extended vacation and want luxury.